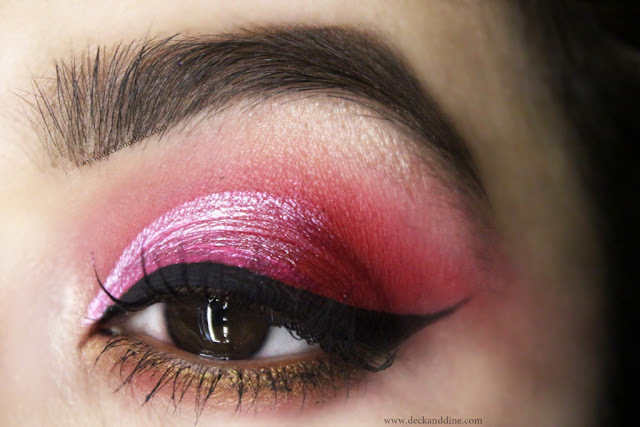 So as promised, I am back with another Valentine’s Day special look, a dramatic pink half cut crease eye makeup that will surely make heads turn. Cut crease eye makeup, if done right, will amp up your look in a wink. But we often find the method a little difficult to do. Cutting crease with a concealer, working with eye shadows in layers and the whole technique, the look does require a steady hand, time, patience and of course practice. Recently when I was doing this look, I tried a new method and it worked out pretty well. Trust me, my work was done in seconds and I my creases were beautifully cut. 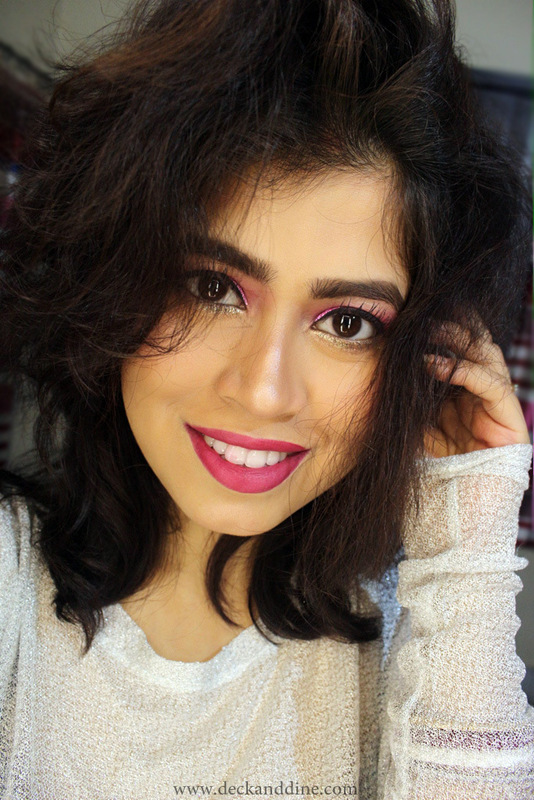 I went for a simple half-cut crease this time, but you can opt for full cut-crease following the same method. Like always, I did my eyes first; so that if there are fall outs, I can easily clean them off later. Start by grooming your brows. Apply a skin colored eye shadow on all over the eye lid and brow bone to get rid of any oil residue on your lids. Then I took an hot pink colored eye shadow on my fluffy brush and start swiping to and fro on the crease, just where your socket line is, blending any harsh lines. Now using your fingers or an eye shadow brush pack on some matte dark red eye shadow on the outer corner your eyes. Blend. Once you feel satisfied with the intensity and the gradient, grab your favorite liquid/gel liner and start lining your upper lash line. Wing it out for the extra drama. Take a golden shimmery eye shadow on the same fluffy brush and go to and fro on your lower lash line. I skipped kohl for this look. But you can definitely apply if you want. Apply loads of mascara to give length and volume to your lashes. I just carefully outlined the portion I want to have the ‘cut-creased’ effect and then filled it up. Then using my tip of my ring finger I patted on the portion where the pink liner meets my shadow, just to have a smoother gradient. And that is it, you are done :D Phewww…. All my eye shadows are from Makeup Revolution 144 Eye shadow palette and Coastal Scents 252 Eye Shadow Palette. Liquid liner is good old Lakme Insta Liner, pink liquid eyeliner is Miss Claire Pearl Liquid Liner in 03 and mascara is L’Oreal Million Lashes. I did my brows using Benefit Ka Brow. Clean off any fallout and apply moisturizer. Wait for 2-3 minutes, till the moisturizer gets absorbed into your skin, and then apply your favorite foundation all over the face, neck and blend well. You can use your fingers, brush or a wet sponge as per your choice. Do correcting and concealing like you would usually do, under your eyes and on any discoloration on the face. My foundation is SephoraBrightening and Hydrating Foundation and corrector and concealer are all from Kryolan Derma Palette. 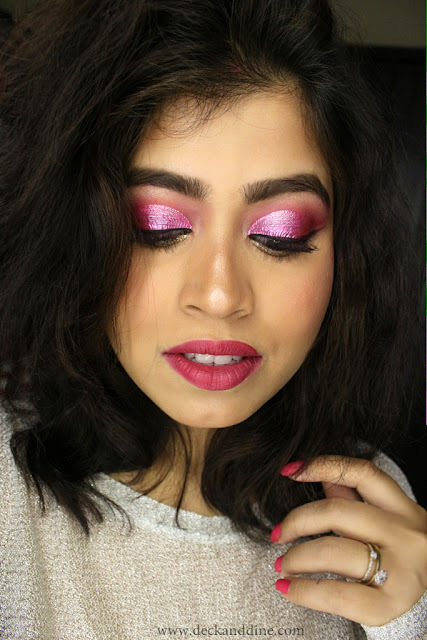 This look calls for a light flush of pink on cheeks. So swirl your brush on a light pink blush, dust of excess and apply on the apple of your cheeks. You can also contour if you want, I generally avoid it. Finally apply highlighter on the high points of your face, you’re your cheek bones, the bridge of your nose, cupid’s bow. I love highlighting my chin as well. My blush is from Ben Nye Blush Palette and highlighter is Benefit CosmeticsHigh Beam Liquid Face Highlighter. My lip color here is a mixture of colors from ABH Lip Palette. Thank you again for the love, I am overwhelmed. What more can I ask for? So Beautiful...It was looking incomplete without pink Shimmery cut crease... Which pink eyeliner have you used? I am in love with this look will surely try to recreate and tag you. Love you. I love how bright this look is! Love the look! It is perfect for Valentine's Day! 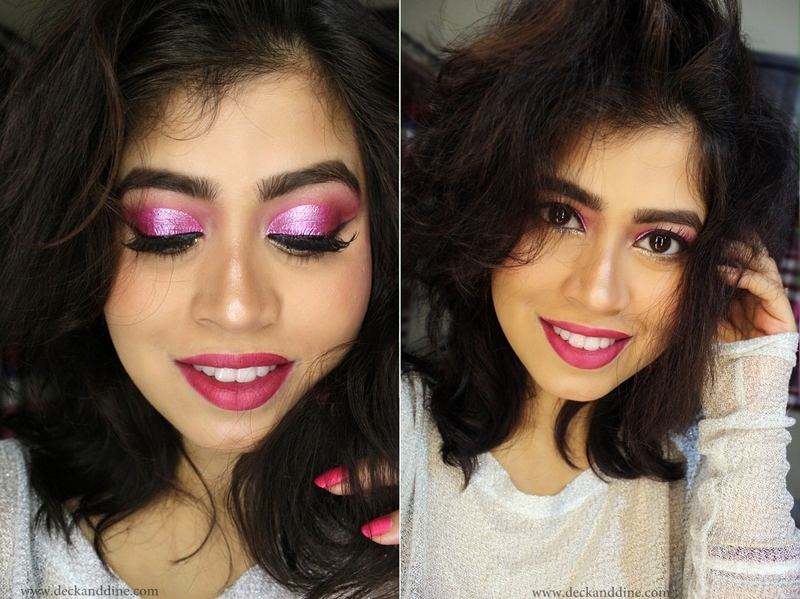 This look is perfect for Valentine's - you really rock the pink look without it looking too cutesy or over the top! That pink is STUNNING! I wish I had make up skills like that! You look beautiful! That pink is so stunning. Wow!!! Your eyes are amazing!!! Can you come do mine?!?!?! Oh my goodness!! You're so talented. I LOVE this look. What a pretty Valentine's Day look. Those colors are beautiful. What a fun look for valentines. I'm terrible at getting my eye shadow to blend nicely but I was blessed with small and hooded eyes. This looks so gorgeous! I think the cut crease was the right choice. So gorgeous! I love the pink shimmery cut crease. Love!! This is sooo pretty! Your makeup is absolutely gorgeous! 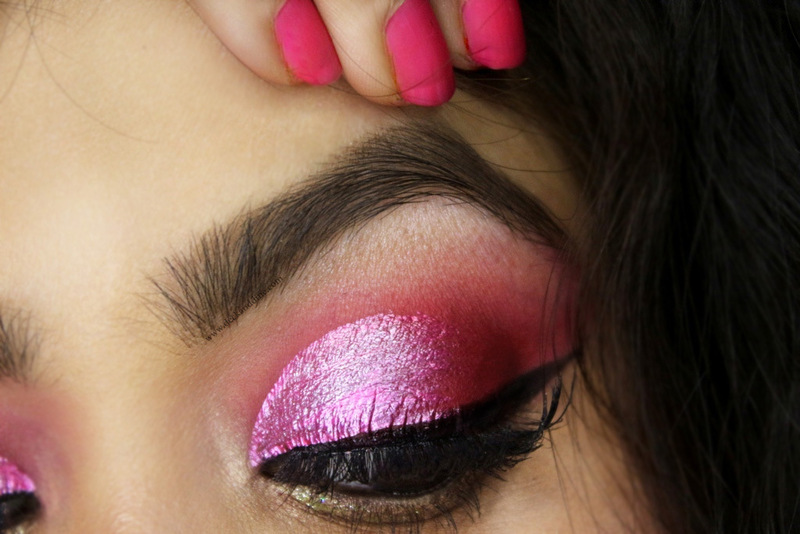 Your pink cut crease is flawless! This look is so chic and feminine. You always make it look so effortless. 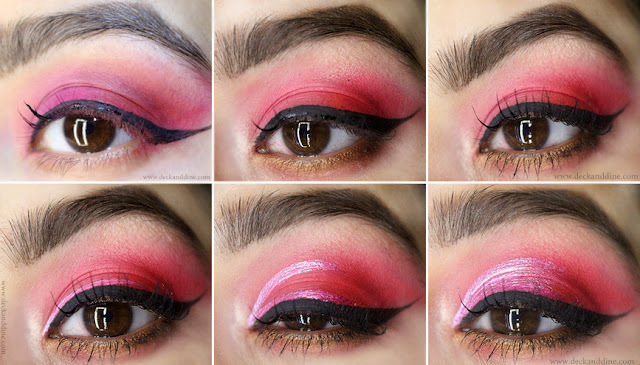 It’s a perfect Valentines Day Eye look. This is absolutely awesome. So gorgeous! 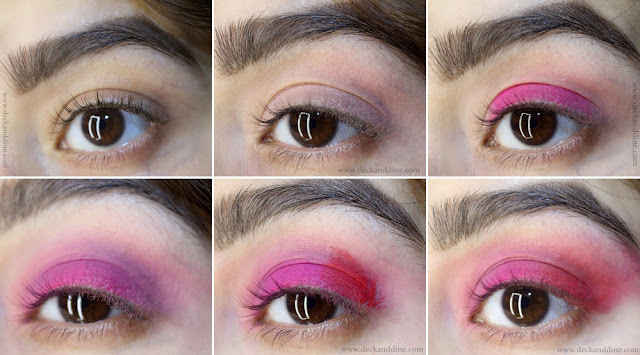 I love that there are some many good red and pink eyeshadows out there now!